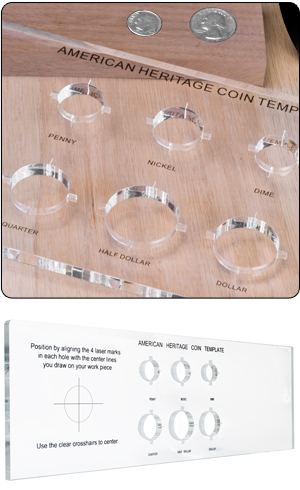 Now you can create your very own unique United States coin displays with your router and this new Coin Template. Take two double sided pieces of tape or two C-clamps and secure the 3/8” thick acrylic template to your work piece. Use a 1/4" dia. down-cut spiral bit and a 3/8" O.D. guide template bushing to rout the proper sized holes for penny, nickel, dime, quarter, half dollar and dollar U.S. coins. Each of the coin openings is laser cut with alignment cross hairs that allows you to align your coins virtually anywhere on your project piece. Simply make your marks on the wood, then line-up the cross hairs to the marks, a perfect line every time! The 3/8" router bit guide bushing and the 1/4" diameter down cut spiral bit are NOT included with the template. The release of the new quarter-dollar coins honoring each state in the union has spurred great interest in collecting a complete set. The U.S. Treasury already has issued numerous coins, and they will mint five new quarters each year, through 2008. Our map gives you a great-looking way to display your collection. The clear acrylic slides out, allowing you to easily add new coins. 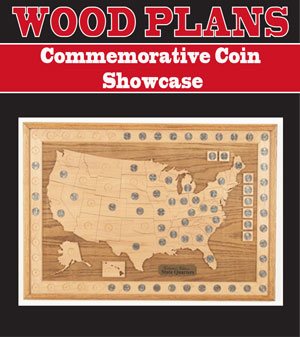 We've made room for two coin sets, one each from the Philadelphia and Denver mints. Wood Plans are shop tested measured drawing and instructions for the project shown. Wood Plans contain no hardware, materials or accessories shown on Cover photo.